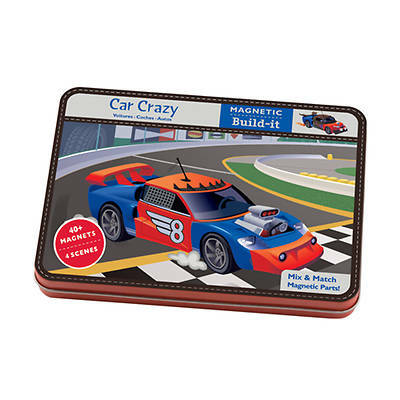 Mudpuppy Car Crazy Magnetic Design Sets provide hours of portable fun. A hinged tin holds 4 illustrated background scenes on 2 double-sided cards plus 3 sheets of interchangeable magnets. Magnets adhere to the tin for fun at home or on the go. Matt LeBarre has illustrated backgrounds of a race track, city street by night, an automotive garage, and a winding mountain road with steep drop-offs and no guardrails. Create mix and match cars and hit the road---safely! - Hinged tin measures 8-3/4 x 6-3/8 x 1"